Sort everything into five piles: stuff to put somewhere else, stuff to donate, stuff to give to someone specific, stuff to throw out, and stuff you are not sure whether to get rid of or keep. Then put the stuff you are not sure about into a box, and on the outside of the box write a date six months to a year from now. If you have not opened the box by the time that date arrives, throw the box away. Without opening it. 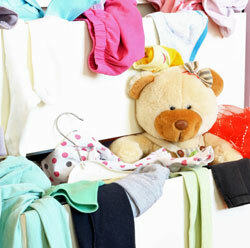 Get laundry baskets, bins, etc., without lids, so it is easier to toss things into them. Think twice before you try to sell stuff. Posting things on eBay, Craigslist or similar sites is time-consuming, especially when you include the time it takes to respond to interested people, show the item and negotiate the deal. If you have something that is truly valuable, that might be worth it. But if you are just trying to get a couple extra bucks for your junk, consider saving yourself the effort and just donating the items instead. Get rid of flat surfaces. For example, if your dining room table always ends up covered with things you dump there, clean it off and then put a large bowl of flowers in the middle. Label and organize photos as you go. That way, when you are gone, your kids will not be trying to figure out who all the people they don’t recognize are. Keep in your car those things you need when you are outside your house. These might include, for example, grocery coupons and reusable grocery bags. Get a bin for things like emergency toys or diapers. Keep a small bin near the door for things you need to return, so you can easily carry the bin to the trunk. Don’t think that a storage unit is the answer. You should focus on getting rid of what you don’t use, not storing it somewhere else. Unless you are looking for a very short-term solution – such as when you are moving and need to keep your things somewhere until you sell your house and are ready to move into another – you don’t need a storage unit. Go through your medicine cabinet at least once a year and safely get rid of any medicine that is expired. With spices, mark on the container when you bought the spice. Most dried spices keep their flavor for only a year or less; check online for specifics, or just open the container and give a sniff. When the spice loses its punch, toss it. If you have not worn something in more than a year, give it away. Try dividers as a way to organize drawers in your dresser, your cabinets and your nightstand. Group things that you use at the same time together and close to where you will need them. For example, keep saucers with cups, and keep pots and pans close to the stove.